Trikonasana – Triangle pose using the arms to lengthen the side waist. Iyengar yoga was the first yoga method I studied and continue to study and my training was done with Alison West in NYC, specialist in Alignment and Backcare yoga. This style of yoga allows me to study and explore the nuances of the human body and is the foundation for all of my prop work. Aligning your body and mind and finding ways to work with ones asymmetries opens up an understanding of the human body at the deepest level. Janu Sirsansa – Head to knee pose using the chair to work on opening and revolving the side body before entering the full pose. 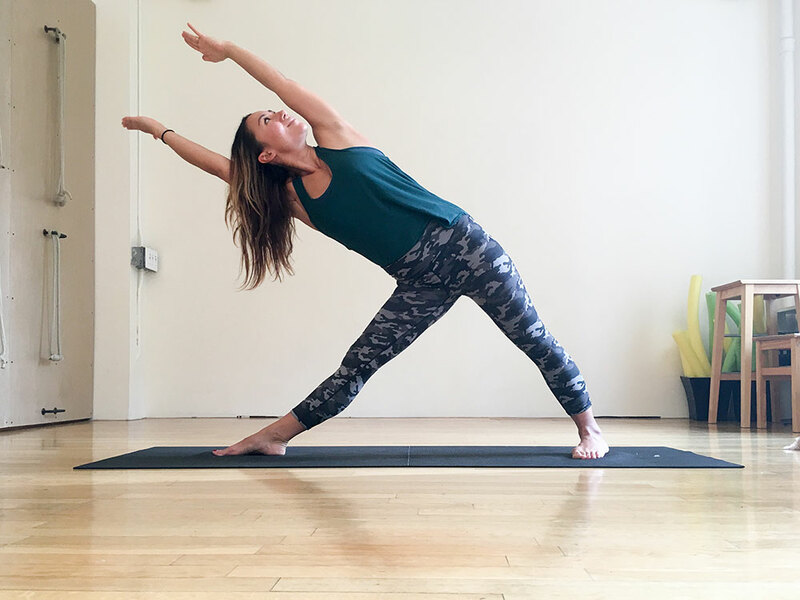 Unlike vinyasa, alignment classes are structural, moving from one pose to the next without ‘flow’ or transition, however, alignment can be applied to any method. Alignment yoga often incorporates the use of multiple props including dowels, chairs, ropes, belts, blocks and slings. Paschimottanasana – Deep forward fold using the arms to extend the spine discourages rounding the back.